Statistically the likelihood of an expedition being successful on the North Side of Mt. Everest is considerably less than 20%. From the perspective of his four expeditions to the North Side (two successful--North Ridge Spring 1991 and 1994, and two unsuccessful--Great Couloir Spring 1982 and 1987), Eric Simonson examines the reasons for success and failure on the North Side of Everest. Time and time again, very strong and experienced teams have successfully climbed to above 8,000 meters, only to be turned back from the summit. Clearly, something is going on here. Why have some teams been successful while most have not? Maybe the mountain is just too high. Many climbers joke that Everest, highest of the fourteen 8,000 meter peaks, is really more like a 9,000 meter peak. Among the successful expeditions, there are clearly two categories. One could use the analogy of an assault rifle versus a hunting rifle. Both are very accurate, but the hunting rifle has fewer bullets. In the first category the Tri-Nation in 1988, the Tri-Nation "Peace Climb" in 1990, and the USA in 1991 stand out. These three expeditions put nearly as many people on top as all the other teams combined. In each case the teams were very strong and experienced. More importantly, they had great depth in their teams, both from the standpoint of climbing strength and of logistics, which enabled them to have the capacity for multiple summit attempts. The 1988 Tri-Nation team was ordered down from the mountain by their leaders after the first successful group, despite having climbers in position for further attempts. They had luck with the weather when they needed it, though each of these teams had great struggles early in the climb, due to the high winds on the lower North Ridge. The Hunting Rifle category might include Messner in 1980, the Australians and USA in 1984, the Canadians and Swiss/French in 1986, and the Italians in 1991. In each of these cases the teams were small, strong and experienced. They had little, if any, Sherpa assistance for load hauling. In most cases their summit shot was a single endeavor, since they did not have the depth in their teams for multiple summit bids. They "went for it" and were successful, enjoying reasonable weather on the summit day, despite having bad weather earlier in their climb. Clearly there was a significant element of luck involved. 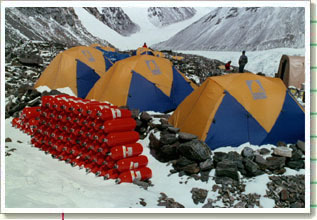 Most of the remaining successful expeditions represent either larger traditional teams that succeeded in getting only a few members to the top, or smaller teams that succeeded by tagging along with larger teams, using the fixed rope and camps installed by others. The latter can represent an irritant to the team that is well provisioned, yet is forced to share the route with teams that use their rope and camps. Clearly, good communication between climb leaders prior to getting to the mountain can help alleviate problems on the mountain, ensuring cooperation. The idea of the solo climb is similarly questionable. Certainly Messner’s 1980 climb was the ultimate solo, as there was not even another team on the mountain. Ed Viesturs 1993 attempts were similarly self-contained. 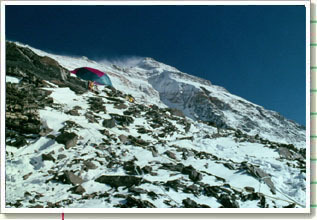 Other solo climbers such as Roger Marshall who came to the mountain in 1987 eschewing any support, yet who quickly sought out medical assistance from other teams when he got sick, or Robert Anderson in 1991 who used the tents, ropes, and oxygen of other teams, make the idea of a "solo" climb questionable. Reasons for failure on the North Side of Everest are numerous. First, Base Camp is a long way from the summit. In order to descend to 17,000 feet, climbers must walk down 12 to 15 miles. There is a real temptation for climbers to stay up high too long, causing deterioration, rather than going all the way down to Base Camp. This is particularly a problem with smaller teams, where the departure of several climbers for Base Camp diminishes the ability of the expedition to maintain the momentum of establishing and stocking high camps. Second, the weather in Tibet is hostile. Pre-monsoon groups often experience cold and wind during March, April, and early May. In particular, the North Ridge from the Col to about 8,000 meters is swept by high wind, making it difficult to establish and stock camps. During the post-monsoon season, the weather is initially milder, but it gets cold and windy as autumn approaches, usually at the same time that climbers are getting high on the mountain. Third, camp sites are limited up high, making it more difficult to put in good camps. At the high camps on the North Ridge, Great Couloir, and Hornbein Couloir, it is necessary to do a lot of ice-chopping to get in a tent during the pre-monsoon season. During the autumn season this is not such a problem, as the considerable snow left from the summer monsoon is easier to dig. In both cases, however, when compared with the immense South Col on the Nepal side, it is more difficult to establish a good high camp on the North Side. Fourth, getting to high camp on the North Side requires two hard days of climbing. This means that a summit push requires at least three to four reasonably good weather days. In contrast, the South Col can be reached in one hard day of climbing from the Western Cwm. It is more difficult to establish and stock the high camps on the North Side, and there is less likelihood of an extended period of good weather there. Finally, the high camp on the North Side is higher than on the South Side. The Great Couloir below the Yellow Band sits at 27,000 feet. Camp 6 on the North Ridge is at 27,300 feet. 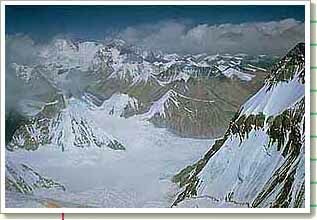 Compare this with the South Col, where high camp is at 26,300 feet, a thousand feet lower. As a result, climbers spend more time up high, which is harder on the body. Summit days are long, and climbers spend a longer time in the Death Zone. On the South Col, teams have waited at high camp for several days for the weather to improve. Many teams have found themselves out of energy late in the expedition. Members are tired and sick after a long time up high. Perhaps some have had to go home or descend due to illness. Camps may have been partially destroyed by the wind, necessitating rebuilding. Finally, a last push is organized by a few climbers, with meager support from the rest of the team. The weather changes and slaps them again, and, without the logistical support to remain high and wait, the team is forced to go down. Now the permit time is almost running out and the team is too beat up to continue. As the final bags are packed onto the trucks and the climbers head for home, the sun comes out and the wind dies. Everest mocks the climbers as they leave, tails between their legs. A long time, a lot of money, and all for what? What does it take to be successful on the North Side? It depends on what the goals and expectations are for the team. If the goal is to climb the mountain in a lightweight style or via a new or difficult route, then the team must realize that they diminish their chance of success. That is the trade-off, unless one is remarkably skilled or lucky or both. For the team that wants to put as many people as possible on top, history suggests that several things will increase the chance of success. First, a good team with high altitude experience is crucial. The team needs depth, either in the form of additional good climbers or Sherpas. Second, it is important to have oxygen available for sleeping at the high camp, as well as for climbing to the summit. While many 8,000 meter peaks have been climbed without oxygen, the added height of Everest and the additional time spent up high make oxygen necessary for all but the truly world-class climber. Third, it is important to have a flexible schedule that allows the team to stay long enough to wait out the weather. Many teams are under a time constraint which allows only one or two attempts. Fourth, good preparation with the proper equipment and supplies is essential. Stoves, tents, rope, fuel, and other equipment must be able to handle the job on the mountain. The food must be appealing, nutritious, and plentiful. Finally, the team needs to have good leadership, and it needs to be "hungry" for the summit. It is not enough to have Sherpas to do the hard work. Team members must be willing to work hard and get involved at every stage of the climb. The Sherpas will be much more effective if they feel that they are climbing with the team members, not for the team members. Team members should plan to climb high to stock camps prior to summit bids. History shows that this is excellent for acclimatization when coupled with rest days lower down at Base Camp. The logistics should be such that all team members feel they have a chance at the top. Many times teams have disintegrated when some members feel that they have no chance and that they are doing all the work for a preordained chosen few who have been selected to be summiters. Out of 136 expeditions launched on the North side of Mt. Everest since 1921, only 22 have successfully put a member on the summit - only 16.8%. With odds of six to one against them, organizers need vast experience, team depth, proper provisioning, clement weather, and of course, luck. In 1994, six North Side climbers summitted the mountain but two failed to return. Two other expedition members perished on the mountain. 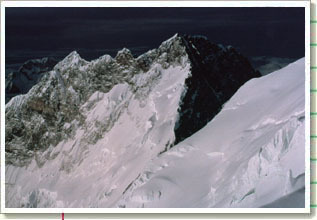 The above is an excerpt from the Mount Everest, Quest for the Summit of Dreams CD-ROM. Interested in more Mount Everest Information?